Pope Francis has appointed Donal McKeown (above) as the new bishop of Derry, some 825 days after the Vatican accepted Dr Seamus Hegarty’s resignation. Bishop-elect McKeown, who is currently an Auxiliary Bishop in the Diocese of Down and Connor, will be formally installed at a ceremony in St Eugene’s Cathedral on 6 April. Speaking at the formal announcement in St Eugene’s on Tuesday morning, Bishop-elect McKeown acknowledged that he was unfamiliar with the diocese, indeed saying that it was his first time to visit the cathedral. He recalled how he had been invited to Dublin last Friday, where the Papal nuncio told him ‘the Holy Father wants you to be bishop of Derry’. “Archbishop Brown’s words still ring in my ears. The 63-year old has spent much of his priesthood working as a teacher, and later school principal in Belfast before being appointed auxiliary bishop in 2001. “I look forward to working with people of faith, and people of doubt, within this wonderful and historic diocese, so that together we can generate hope for our young people and create communities worthy of them,” Bishop McKeown said, adding that he felt energised and enthused by the challenge. “I know that many people across the diocese have suffered hard times,” he said. 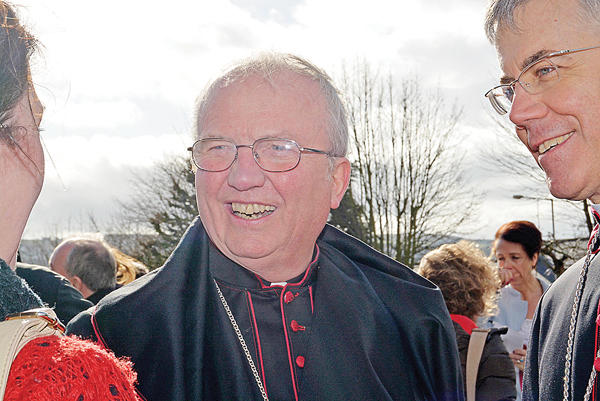 Fr Francis Bradley, who served as diocesan administrator since last April, spoke of the anxiety and anticipation felt while Derry had been without a bishop for two years and three months, and how glad he was that the wait had ended. “A bishop of tenderness and courage stands among us to lead us and guide us, in holiness and truth, in freedom and peace,” Fr Bradley said.